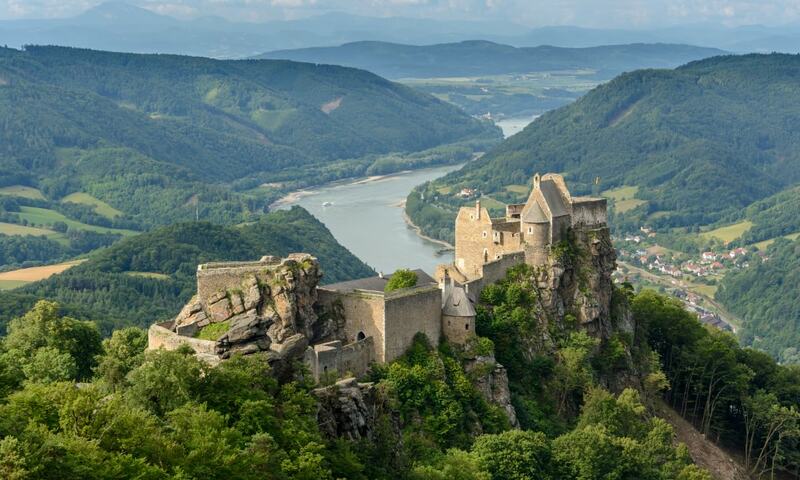 Aggstein Castle is a ruined castle on the right bank of the Danube in Wachau, Lower Austria. The castle ruins are situated at about 300 metres above the right bank of the Danube on an outcrop running from east to west. It is some 150 metres long and has a rock structure at both ends. In the early 12th century, the time of the Kuenrings, the castle was besieged and destroyed at least twice. After the Ottomans burned it down in the 15th century, the castle was redesigned as a fort, equipped with embrasures for the artillery. From 2003 to 2004 the Aggstein Castle Restoration project was set up. As part of a series of postage stamps featuring the landscapes of Austria, on 30 November 1973 the Austrian Postal Service issued a 5-Schilling definitive stamp on this motif.